The world of school marketing has changed forever. People are tired of being marketed to and have found effective ways of shutting off traditional marketing tactics. Smart marketers understand that there has to be a better way – and that way is to attract your target audience using content marketing that contains unique and compelling visuals. Finding just the right image can turn concepts and intangible ideas into something more concrete. High-quality images have the power to influence the perception of the intended viewer and help them envision your brand and its message in their mind’s eye. Harnessing the power of images can make a marketing plan more powerful and memorable. Most marketers are aware of premium stock photo websites like Getty Images, iStockPhoto, and Shutterstock. But some are not aware that there are many free websites that offer amazingly beautiful and original images that are free to use without attribution under the Creative Commons CC0 license agreement. 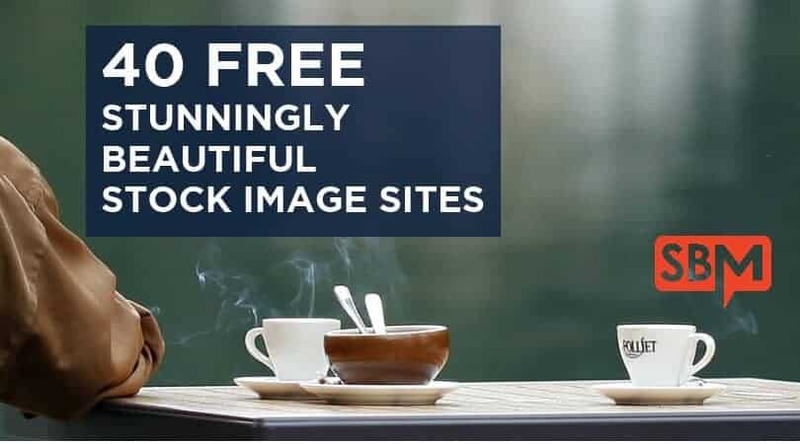 Exclusive Bonus: Download the pdf of 40 FREE Stunningly Beautiful Stock Image Sites to reference for when you need an image for a blog post or social media post. Here are 40 of my favorite free stock photo sites for you to peruse and enjoy to your heart’s content. A daily dose of FREE, refreshing, intriguing images for your creative projects. Every week this site offers 6 free design “goods” that range from images, fonts, vectors, patterns, textures and much more. But don’t wait – these downloads are only free for 1 week and then they are available for purchase. It is such a treat to get these gorgeous images in my inbox every month. The photo shoots are stunning and some sets include video photography. Highly recommended! Get free high-resolution digital pictures for all your needs! You can download free images for your website, blog, forum, presentations and more. You can resize, crop and customize free images as you wish. Dreamstime has one of the largest libraries of stock photos on the net. If you are a web designer, this is a good resource to download high-resolution RF stock images for free. Free to use original photography by photographer Daria. Fotolia is one of the oldest stock photo sites on the net. Their free section is quite good, but the site changes every day. Sometimes free photos that were there yesterday may not be there the next. FreeDigitalPhotos.net is a very good place on the web to download free images for use in corporate and personal projects. Their images can be used by web designers, graphic designers and editors to illustrate and brighten up websites and printed media such as newspapers and magazines. This site offers free icons, patterns, brushes, custom shapes, layer styles, layered PSDs, textures, web elements and other design resources that are free to use for both personal and commercial projects. Over 2.4 million photos and illustrations; over 389,000 of them are free. A well-developed search engine makes it easy to find what you’re looking for. The Free Photos Bank site provides a typical range of free photos – people, animals, landscapes and so on. Freerange Stock was formed with the goal to provide quality stock photos for commercial and non-commercial use for free. It contains thousands of exclusive images. Well worth the time it takes to click here and search. Free stock photos that are copyright free. Very beautiful, high-resolution images. Gratisography is a free stock image site shared free of copyright restrictions by Ryan McGuire of Bells Design. IM Free offers a collection of free resources, all for commercial use. iStockphoto is one of the most popular stock photo sites on the net. They only offer one free image a week, but it is always high quality. Absolutely stunning photography completely free and usable under the creative commons CC0 license. A wide variety of images with different themes. These images are unique and have a high-resolution. The images with people are casual and work well cropped to convey just the right segment of the image for your purpose. All images are copyright free. High-resolution photography. A new photographer is featured each week. Unique images with no copyright restrictions. Love this site! Free for commercial use photos by Jeffrey Betts. CC0 license. Lots of images organized by lots of categories. Nasa’s image library contains copyright-free historical and scientific images. Stunning photographs. New images weekly. Easy to use search feature. No copyright restrictions. What’s not to love? Photographers submit photos that are available for free. This is a great site for original and nice, but not-too-polished images. 100’s of new free images uploaded daily. This is a great resource with unique, high-quality images. Photo laboratory photl.com is the owner and distributor of the largest collection of exclusive stock photo images. You can download up to 3 free images from this site that can be downloaded and used for personal, educational and other non-commercial purposes free of charge. Free, high-quality photos delivered to your inbox daily. The images on Picography are beautiful, artistic, mostly-landscape photographs. There are free and premium images available. You can sign up to have free images sent to your inbox monthly. All photos on Pixabay are free and royalty free under the Creative Commons CC0 license. This is an aggregated site with over 820,000 free stock photos, vectors and illustrations. HIGHLY RECOMMENDED. RGBStock.com is created by a group of enthusiastic photographers and graphic artists. Their vision is to build the best free stock image site on the web. They are dedicated to making high-quality images available to those who cannot afford to pay for them. Over 100,000 free photos. Unlimited free downloads. Royalty-free license. You have to set up a free account in order to download. StockSnap.io has a fine selection of beautiful stock photos that are available for personal or commercial use under creative commons public domain. Hundreds of new images are uploaded weekly, ensuring a fresh supply of breathtakingly beautiful images. This site offers free and curated (paid for) images that are gorgeous. Not as wide of a variety as some other sites, but the images are very high quality. Stockvault.net is a stock photo sharing website where photographers, designers, and students can share their photographs, graphics and image files with each other for free. SXC was launched in February 2001 as an alternative for expensive stock photography. The idea was to create a site where creative people could exchange their photos for inspiration or work. Unsplash is a site where photographers share their images and give permission for them to be used freely under the Creative Commons Zero license. Stunning photographs that are easy to search. Cool photos. Choose by color. Lots of contributing photographers. Created and managed by designers. Large collection of vintage images. Wikimedia Commons is a media file repository making available public domain and freely-licensed educational media content (images, sound and video clips) to everyone, in their own language. The repository is created and maintained not by paid archivists, but by volunteers. Appreciate this listing, several on there I have never seen before.